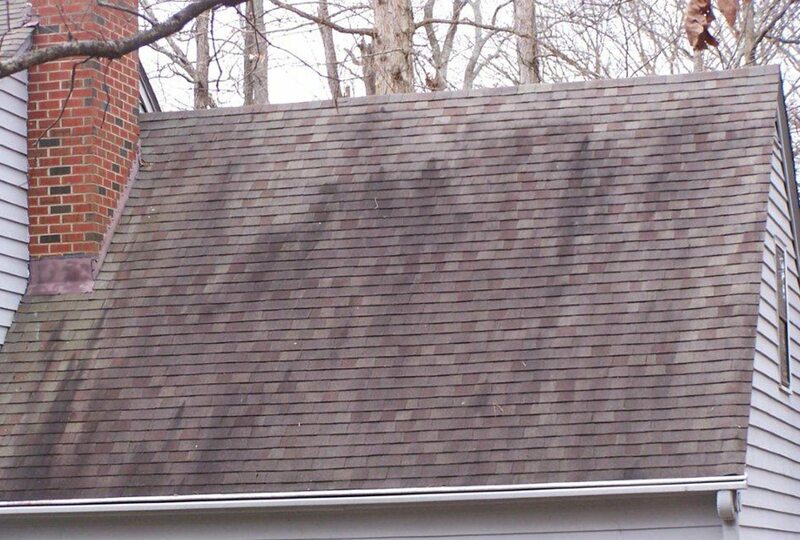 Let’s talk about those stains on your roof. Or, if not your roof, that roof down the street. Bottom line – you’ve seen a stained roof. And it looked ugly. 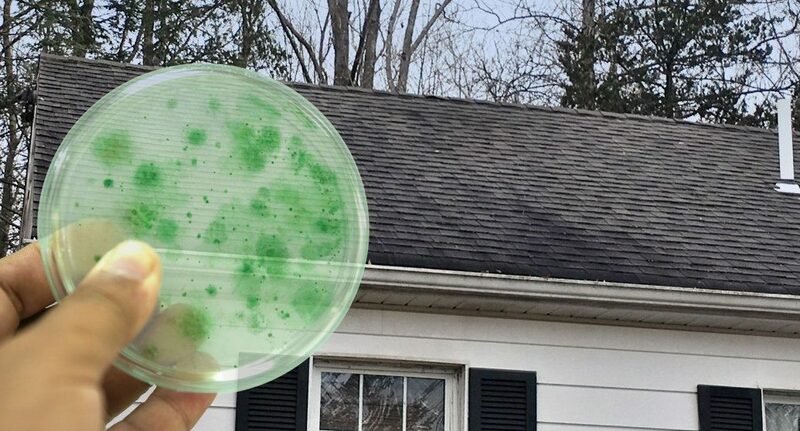 Whether your roof is stained, or you want to prevent it from staining in the future, let’s put on our science hats for a few minutes and learn a little about roof stains. Roof stains are caused by algae (technically it’s Gloeocapsa Magma, but we’ll just call it algae, if that’s ok). Algae grows on roofs where moisture is present, especially in shady, humid areas. And fun fact: the dark stains you see aren’t actually the algae itself – the stains are a coating the algae develops to protect itself from the sun. So it’s growing on roofs all over the world and it has armor. Wonderful. Also wonderful: algae can spread through the air. So if your neighbor’s roof is stained, it can spread to yours. On the bright side, algae stains don’t harm the actual function of the shingles, though they do, obviously, change the look of the home. A stained roof can dramatically affect the resale value of a property. Algae stains come off pretty easily. The Asphalt Roofing Manufacturers Association recommends applying a 50/50 mix of chlorine bleach and water to a stained roof, and then rinsing it off after twenty minutes. As always, use proper safety equipment if you’re working on your own roof, or contact a professional. 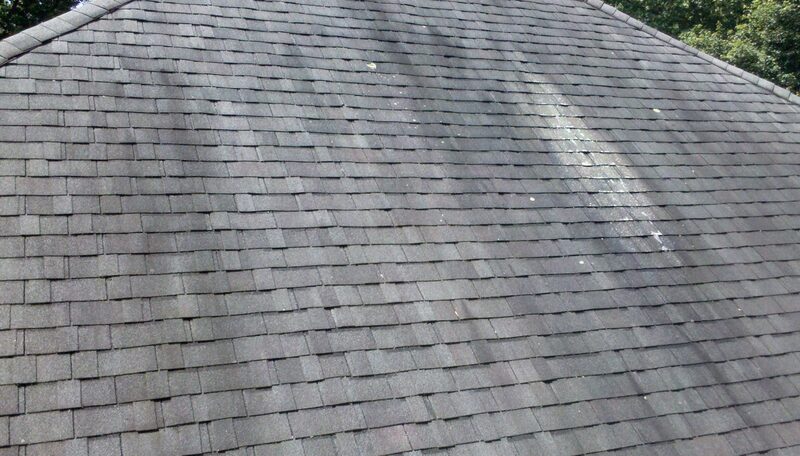 Don’t powerwash your roof – the high pressure can damage shingles. This method won’t prevent algae from coming back, but will usually keep your roof clean for about a year. You have an algae free roof? No Gloeocapsa Magma to be seen? Great! Let’s talk about what you can do to keep it that way. Trimming overhanging branches, cleaning leaves and debris off your roof, and cleaning your gutters regularly can call help prevent algae. As always, use safety equipment on the roof, or contact a professional. If your roof is in good shape and you expect it to last you quite a few more years, you can protect it from stains by installing strips of metal like zinc or copper near the top of the roof. These strips treat your shingles by ionizing the rain that falls on them, spreading the ions down the roof as the rain runs down. The most effective way to prevent algae is to roof your house with algae resistant shingles. They have granules of those ionizing metals built into them, and can prevent algae not only from rainwater, but from humidity and dew as well. Now, reroofing your entire house just to prevent algae is a pretty expensive option. But if you’re reroofing anyway, we recommend asking about algae resistant shingles if algae stains are common in your area. We use GAF Stainguard shingles, but other brands have this option, too. To learn more about how to treat or prevent algae on your roof, or for assistance with any other roof-related question, please CONTACT US today! Prev « What Type of Roof Do I Have?